As a reporter for TrainWeb.com, while traveling with the group of officials from station to station in California to celebrate the Two Millionth Rider of Pacific Surfliner on September 30, 2003, I was issued a 'Front End Pass' to ride with Engineer, Leonard Sandoval, in Pacific Surfliner engine #452. The first leg of this cab ride was in the 'Cab Car' which is what looks like the back of the train to most people, even though the train is going 'back end first.' If you have noticed when you see a passenger train 'going backwards,' upon closer inspection, you will see a cab for the engineer in the front of the train. This cab is not very noticeable from outside the train, except that there will be white headlights on this car (when it is at the head of the train/red when it is at the back end), and rear view mirrors for the engineer, as well as windshield wipers. 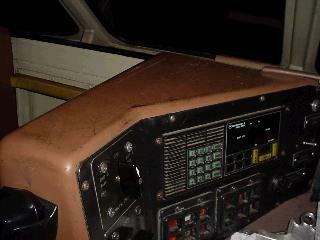 The engineer will be sitting on the right side of this cab section of the passenger car. 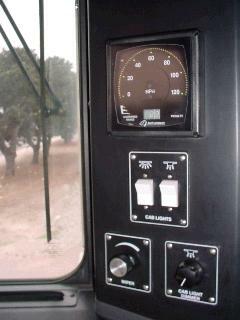 This is the most accessible view for the rail traveler of the engineer's controls since there is a window in the door between the passenger section and his work station through which any passenger on the train may see him working. In my case, I was allowed through this door to the seat on the left side of the cab where I could see what the engineer sees through the windows and watch him work and interview him. Jack Wilson issued the Front End Pass and seemed somewhat apologetic about it only being a cab car ride from Los Angeles to Santa Barbara, but for me this would be my first cab ride of any description and I was very pleased at the opportunity. Jack asked what part of the trip between Los Angeles Union Statikon (LAUS) and Santa Barbara I wanted to ride in the cab and suggested Oxnard to SB, since it was all ocean view. I immediately agreed and after the Los Angeles festivities, I boarded the Business Class car and waited with great anticipation for Oxnard station to be called. 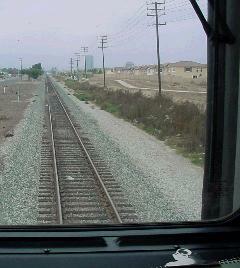 Before we reached Oxnard, I made my way through the 5-car train to the front and sat just outside the cab. Another gentleman was seated in the left seat talking with Leonard and the door was open, so I could hear their conversation. At Oxnard, I made myself known, the other gentleman relinquished the honored seat, and I moved into my first cab ride of my 61-year life! 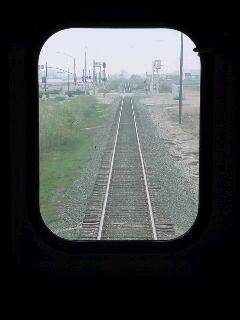 The engineer's view from the cab car (and my view for the first time). You'll have to take my word for it that this is not out the back of the train, and that we were going toward that green pickup. This position is called Second Engineer (if the person here is a qualified engineer), but Amtrak does not have a second engineer on the Pacific Surfliner. My view of things to the right of the windshield. Each 6 months an inspector sits here and watches the engineer and quizzes him on rules of the road and grants another 6 months on his license if he passes. Radio handset left of my windshield. 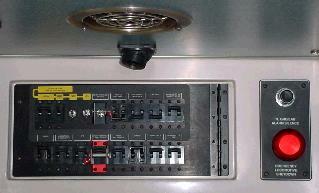 Controls to the right of the engineer. 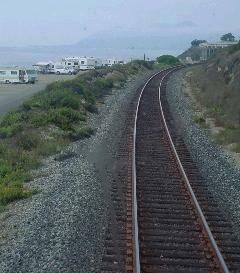 This was my first trip along this portion of the California coast when I didn't take a lot of photographs. Instead, I was listening and learning this time. Engineer Leonard Sandoval was most congenial and informative as I took notes and asked questions. He became a Conductor in 1997 and an Engineer in 1999. His training included 7 weeks at "Choo Choo U." in Delaware followed by on the job training with an Instructor. Engineers must qualify on a territory, (memorizing speeds, curves, and sidings) before they can operate the train on that run. 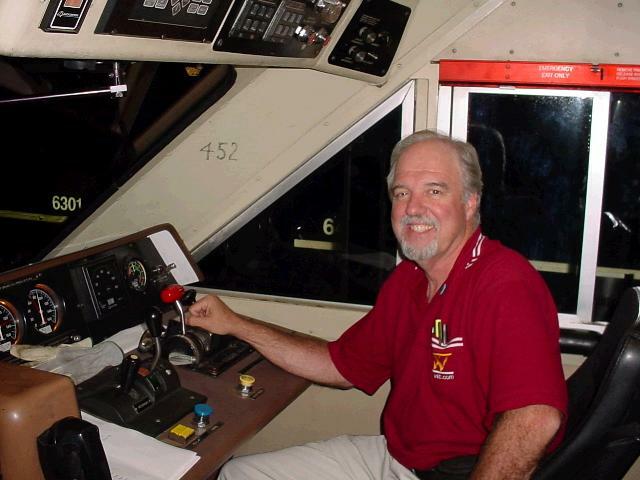 The Engineer is in charge of the mechanical operation of the train and is in radio communication with the Conductor concerning any special needs at stations (such as ADA's onboard or the platform), when it is time to leave the station he hears"769 High Ball." After such a radio message from the Conductor, it is "2 Whistles and we're off," says Leonard. Leonard spent 16 years in the Marines. His goal was to become a US Marshall. His dad was an engineer. He had a great quote about why he is now a railroad engineer, "The Career chooses the man, the man doesn't choose the career." The best thing about the job is, "I'm not in an office." He liked his Conductor job also, because he likes people. This was obvious by the way he treated this 'green horn' riding with him. He communicates by radio...with the Conductor and Dispatcher and other trains, and more importantly by the signals along the route. His communication with the world he is passing is by the train's air horns. He blows the traditional 2 longs, a short, and a long which is held until the engine is on the crossing. He knows when he is approaching a crossing by "W" or "X" signs along the right-of-way. If there are numbers on the same sign, like "1/4," they are alerting the engineer how far it is to the next crossing. Without the numbers, the engineer knows he is to start blowing the traditional horn pattern 1/4 mile ahead of the crossing. If there are numbers on the signs, such as "X/2" or "W/2" that means there are two close crossings ahead. He also communicates with track workers and members of the public with a wave and a couple of toots of the horn to acknowledge that he has seen them waving. When the horn is blown, it activates the two bright, alternating ditch lights on the front of the engine, and activates the bell. Both the ditch lights and the bell stop automatically about a minute after being activiated and the main headlight stays on throughout. The Engineer can activate the bell without blowing the horn. The bell is on for stations and for passing engines instead of the horn. He would like to be able to turn off the ditch lights before the pre-set wait time so that approaching trains don't have to be blinded by his lights. I was glad this cab ride was after dark or I wouldn't have noticed all these factors. California law requires that he blow the horn at all crossings, private or otherwise. Crossing arms are set by the speed of the train and all were working as we traveled through the night. In case one isn't working, the Engineer stops the train and the Conductor walks into the intersections and observes the train passing and the stopped traffic. 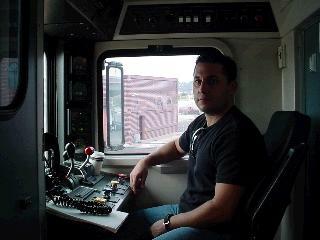 Leonard also is an Engineer on the Southwest Chief between LA and Kingman. One difference between the Surfliner engine and the Genesis is a little bit less visibility in the Genesis because of the large portion of solid body between the windshield and the side windows. Also, since the SW Chief has the 'Express' freight cars on the back, the brakes are different. 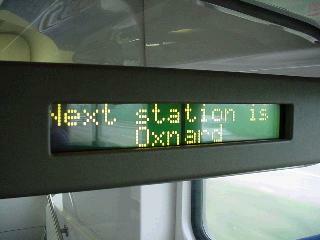 Passenger trains have "graduated release" brakes where the air is recharged quickly. Freight trains (or passenger trains with freight cars like the Southwest Chief) have "direct release" brakes where all the air is used in one application and must be recharged before use again. I asked Leonard about the old 'Dead Man's Switch" that I'd heard about on steam engines when I was a kid. He said that they found that it was ruining engineer's legs having to have their foot on a petal, holding it down, their entire work shift and discontinued it. Modern engines, however, have computers that would stop the train if their was a problem with the engineer not being able to complete his work. As we pulled into a station and stopped, I asked Leonard how he knew where to place the engine. This is part of having the route memorized. That particular station stop, Leonard wanted the last car in the set to be past the nearby crossing so traffic wouldn't have to stop during his time in the station. 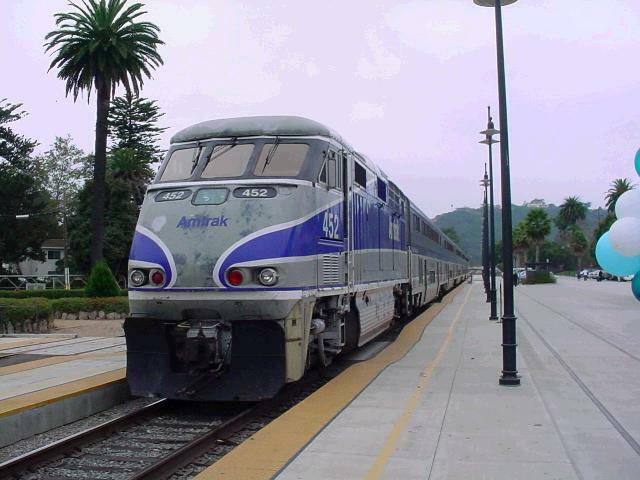 Other stations might have a sign at eyelevel to the engineer stating where to spot the cab, but the length of your train that day would need to be considered and which train you are running, Metrolink, Surfliner, Amtrak SouthWest Chief, etc. 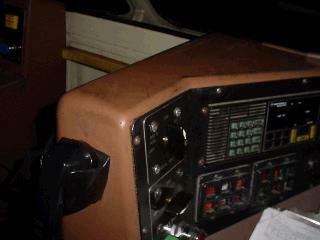 I was seated in the "Second Engineer's" seat for this cab ride, and Leonard showed me a 3rd jump seat. 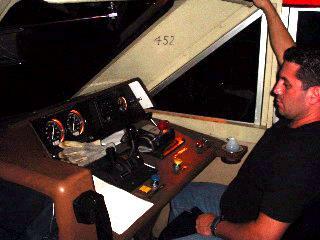 On onernight runs there is a Second Engineer who would be in my place. Engineers have a 6 hr. 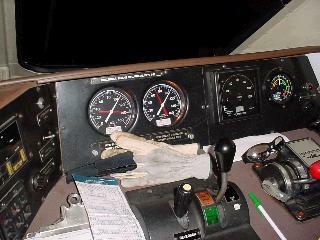 limit of "Throttle Time." DOT has a limit of 12 hr. shifts with 10 hrs. rest, or if less than 12 hrs., 8 hours rest. A motel room is provided for the 'rest' time. The run from LA to San Luis Obispo is 6 hours, by with one engineer there is no time for a break, even a restroom break. Of course, an engineer can stop the train for this activity, or, as on this trip, while on a siding, take care of business at that time. Leonard is on the 'Extra Board' and can be called for jobs on any route on which he is qualified - San Diego to San Luis Obispo - the Southwest Chief to Kingman, or yard work. This Surfliner F-59 engine is 3,000 horsepower with 4 traction motors. The diesel engine generates direct current for the traction motors. Every six months an inspector rides along with the engineer to observe and ask questions and, if satisfied results, renews the engineer's license. 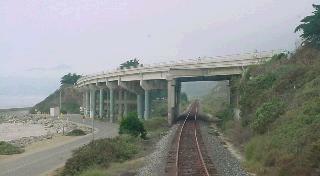 Along the route south of Santa Barbara are some wires Leonard called 'slide detectors' that, if bumped or broken by a landslide or falling rocks, would alert the railroad and engineers. There is a 79 mph speed limit in many parts of the US, but there is a spot west of Kingman where the limit is 90 mph. At one slightly rough spot in the cab ride, Leonard said even the same model of engines ride differently. They need the shocks changed now and then just like a car. Signals vary with the railroad on which you travel, necessitating the law that you carry a pack full of rule books and refer to them when needed. Signal lights are not consistent, but on our part of the railroad a signal with a number is telling you how the next signal is set. Signal blocks are approximately 2 miles long in California. Engineers are required to stop 400 feet from a red signal and wait. In our case, we were ordered to a siding and Leonard pulled to within 400 feet of the red signal until the approaching engine went by and the signal changed (and the switch was remotely changed) so we could go back on the main track. There are many 'detectors' along the railroad, you may have heard the automatic one responding as you pass if you carry a radio while traveling by rail. There are 'High Wide' detectors on sections of the railroad before tunnels. Leonard is considering writing a cookbook of Railroad Engineers' favorite recipes for meals that can be cooked on top of the engine! He also related that the best place to learn history about railroads is the History Channel. In fact, when I asked him why the engineer's controls are always on the right side of the engine, he said, "I don't know, but I'll bet you can find that out on the History Channel." You have to be able to drive the train watching the ground if it is so foggy you cannot see beyond the windshield. You have to watch the controls for air pressure etc. And, you have to do all this safely so that your cargo of passengers is not harmed and you will have your license renewed for another six months. 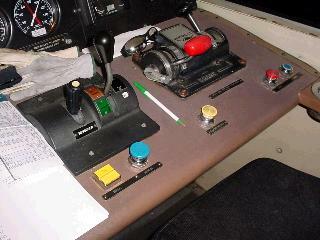 Controls to the Engineer's left. Leonard had to multi-task to complete all his duties. 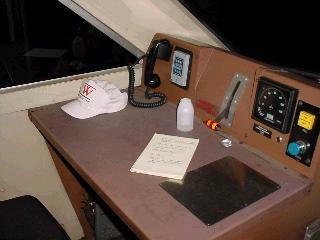 Each Engineer's workspace has a reading light, windshield wiper (without fluid to clean the windshield), full cab light and sun visor. 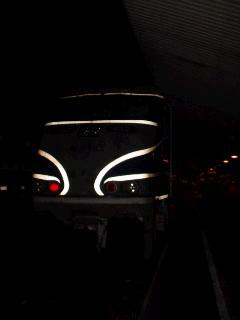 The full cab light is turned off during night travel for better visibility of the right-of-way ahead. 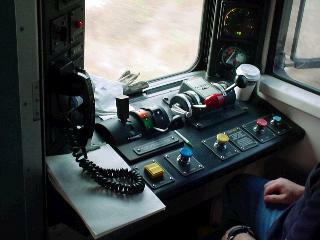 Engineer #2's space on the left of the cab. In the photo above/left you may see the edge of a laptop under the desk. I could see the lighted keyboard in the dark. 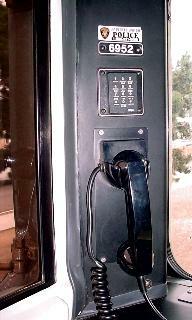 This computer can be used for communication by a Second Engineer, but the single engineer does not have time to use it. It has GPS capability. 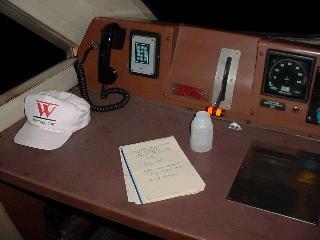 My Official TrainWeb.com hat, reporter's notepad, and "Railroad Water" provided by Leonard. He has a refrigerator for such items, but has to bring his own food. Bathroom is between Engineer 2 and Engineer's stations, middle of the cab is a small stairway forward into the cowl for toilet facility. 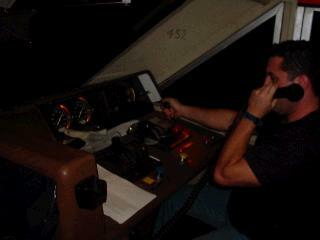 Leonard took my picture at the controls after we arrived at LAUS and everything was secured. The smile shows the satisfaction I got from my first ever cab ride and it was from Santa Barbara, CA, to Los Angeles, between 7 p.m. and 10 p.m. September 30, 2003. A most memorable day! 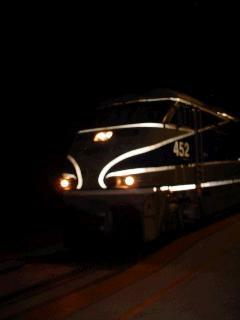 I looked back to Engine # 452 and she gave me a wink (unless one red light was out) as I returned to my Business Class seat for the ride to Fullerton, my home station. What a Day! Thank you Engineer Leonard Sandoval!